This book examines claims for recognition of cultural difference from immigrant and Indigenous minorities, highlighting the ways in which they intersect with ideas of national community. 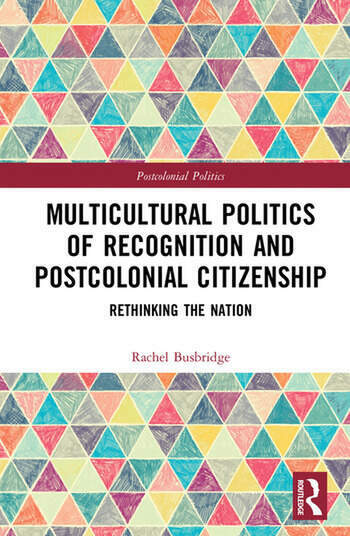 Busbridge argues that there is an important, albeit under-explored, relationship between nation and multicultural politics of recognition. Drawing on the Australian context, the book explores how nation features as a productive, if somewhat ambivalent, discursive resource in contemporary Muslim and Aboriginal struggles to be recognised. In demanding recognition, minorities enter into the business of ‘making the nation’ by positing alternative conceptions of national identity, culture and belonging that are more attentive to their differences and claims. This dynamic is engaged as an expression of ‘postcolonial citizenship’. Postcolonial citizenship is imagined in terms of the ways in which minority groups actualise multicultural realities through rewriting ideas of national community. It underlines the critical importance of revising the power relations that deem some groups ‘more national’ and others less so – and which, in Western multicultural societies, are typically tied to notions of the ‘West’ and its ‘others’. This book is an important conceptual, theoretical and political intervention that brings postcolonialism and multiculturalism into dialogue on the increasingly potent issues of nation and national identity. It will be of great interest to scholars and students of sociology, politics, postcolonial studies, culture, identity and nation. 3 Postcolonial politics of recognition? Rachel Busbridge is a Research Associate of the Thesis Eleven Centre for Cultural Sociology at La Trobe University in Melbourne, Australia.